Van Gogh’s first post was as a missionary in the coal mining region in Belgium where he lived simply, sleeping on straw in a small hut. But this behaviour seemed fanatical and undignified to the bourgeois church officials, and Vincent was removed from his post. Greatly disillusioned, van Gogh now focused his considerable energy and determination on painting. Throughout his life van Gogh’s paintings, especially his portraits, showed his continuing sympathy for working-class people. In one of his earliest paintings, The Potato Eaters, a gaunt family gathers around a table staring hungrily at their meagre supper. The painting’s dark tones, brown, black, and gray, emphasize the grimness of their circumstances. Then his brother Theo, an art dealer in Paris at the time, encouraged him to paint in lighter tones as the Impressionists were doing. This was reinforced for van Gogh when he moved shortly afterwards to live in Arles in the south of France where light was so contrastingly different from his homeland in The Netherlands. The paintings that follow have a lilting feel to them, as though the landscapes lifted his mood. The world might be full of injustice and inequality, but still there was beauty in the countryside. It was when Theo introduced Vincent to the Parisian Impressionists that Vincent’s style exploded into the colour and texture we recognize in his most famous works. In addition to the portraits, fields, and flowers that he’s famous for, van Gogh also did paintings based on the work of earlier artists. One example is The Good Samaritan, after Delacroix. The composition of van Gogh’s work is similar to that of Delacroix, with the beaten man being lifted by the Samaritan onto his own horse. Van Gogh’s lighter version, however, makes the ‘good’ people who passed the wounded man without helping, a key part of the parable, much easier to see. Van Gogh may have seen these men as the church leaders who were so unsympathetic with his own care for the needy. They are small and pale, insignificant to the main drama of the story. Van Gogh based his painting The Raising of Lazarus on a Rembrandt etching. In Rembrandt’s version a group of people gather around the outside of a cave-like tomb watching as Jesus raises Lazarus. In van Gogh’s version, the scene is closer and more intimate. We see only three people, Mary and Martha discovering their now-living brother Lazarus. Jesus is not in the painting, although some critics say that the sun represents Jesus. The sun dominates the painting and can be seen as the fourth major element of the simplified composition. This without doubt reflects van Gogh’s deep knowledge of the Bible and its reference to the text that ‘the sun of righteousness will rise with healing in its wings’ (Malachi 3:20). 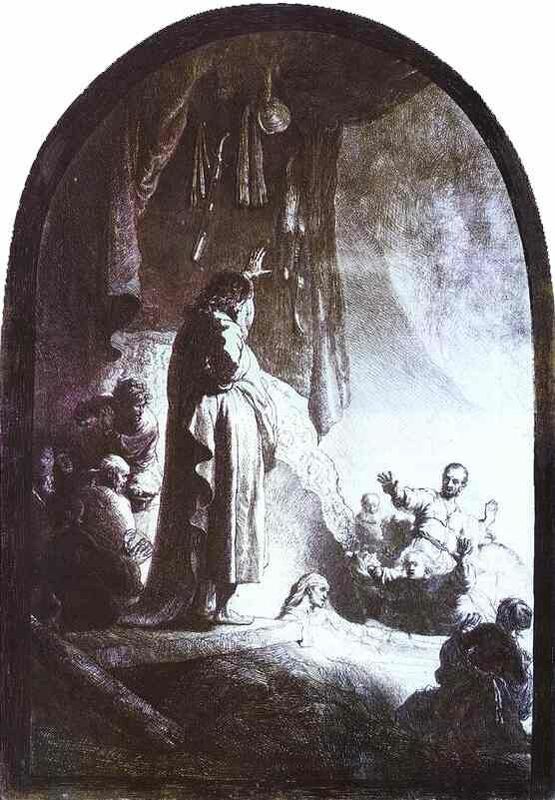 The Rembrandt etching is mostly rendered in dark shadows with light dramatically focused on Lazarus. 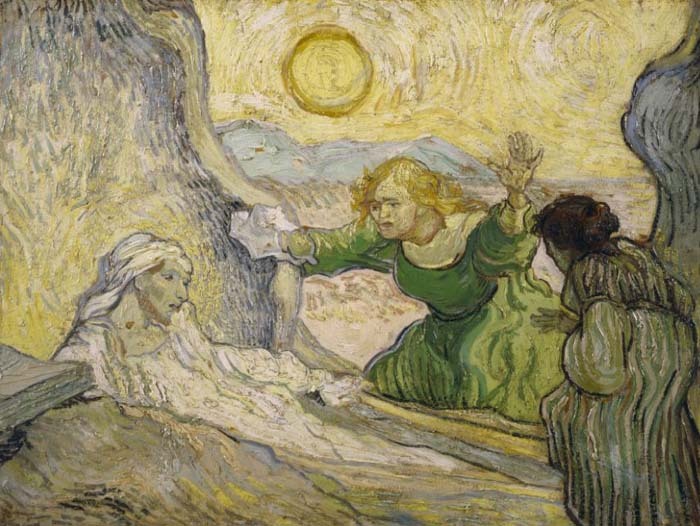 In van Gogh’s version, light from the sun radiates through the whole painting, as the miracle reflects the power of the One who can give life. This is a very personal work for van Gogh, who at that time was suffering from severe mental disruption due most probably to a type of inherited genetic epilepsy. He was aware that he was ill and ‘worked furiously’ during periods of lucidity. As he neared the end of his increasingly difficult life, Vincent endured both physical pain and mental confusion, yet wrote to his brother that ‘religious thoughts’ sometimes gave him great consolation. His Lazarus looks dazed and surprised to find himself waking up in sunshine. This Lazarus has the face of Van Gogh, the seriously ill artist seeing in the resurrection of Lazarus hope for his own! 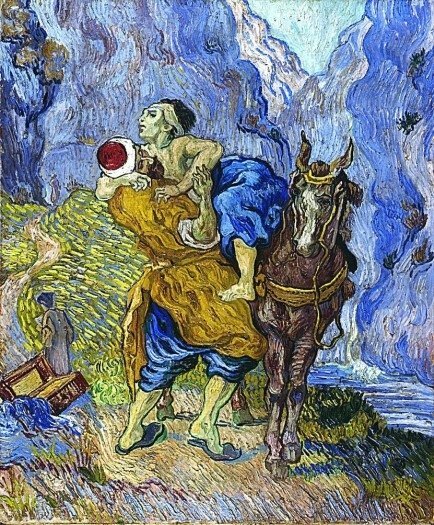 Vincent van Gogh, The Good Samaritan (after Delacroix),1890, oil on canvas, 73 x 60 cm, Kröller Müller Museum, Otterlo, The Netherlands. Vincent van Gogh, The Raising of Lazarus (after Rembrandt),1890, oil on canvas, 50 x 65 cm, Van Gogh Museum, Amsterdam, The Netherlands. 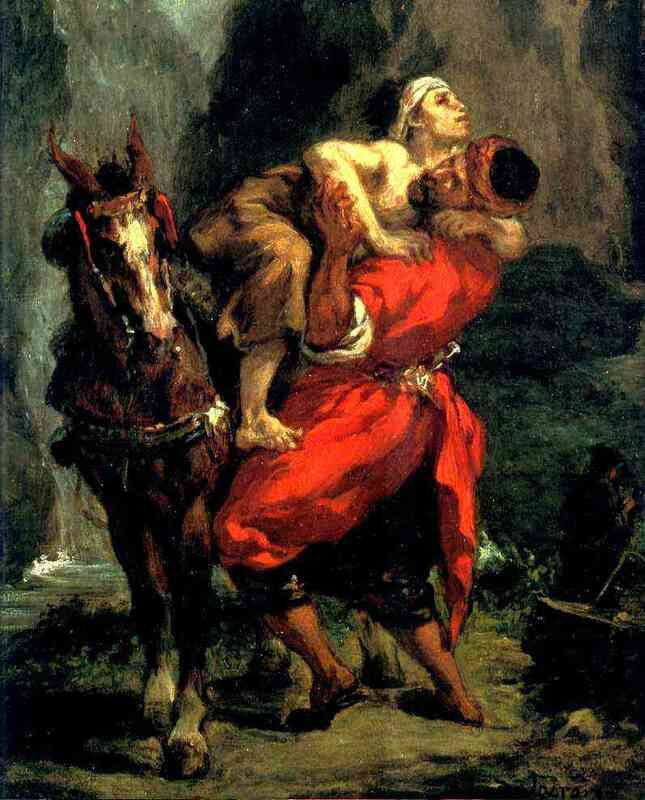 Eugène Delacroix: The Good Samaritan, 1849, oil on canvas, 37 x 30 cm, private collection. Rembrandt van Rijn: The Raising of Lazarus, 1630, etching, 37 x 26 cm, Rijksmuseum Amsterdam, The Netherlands. Sharon Gallagher is editor of Radix magazine and associate director of New College Berkeley. This article was originally published in Radix magazine, http://http://www.radixmagazine.com.